OrionVM honored as one of the top 20 Cloud Infrastructure Vendors Of The CRN 2015 Cloud 100. OrionVM® (http://www.orionvm.com), a leading provider of wholesale Infrastructure as a Service (IaaS) and next-generation cloud technology, today announced it has earned recognition on The Channel Company’s CRN 100 Coolest Cloud Computing Vendors of 2015, and specifically as one of the top 20 Coolest Cloud Infrastructure Vendors Of The 2015 Cloud 100 (http://bit.ly/1AwBY3X). This annual list recognizes some of the most innovative cloud companies supporting the IT channel today. The 100 Coolest Cloud Computing Vendors honor is presented to companies based on their approach to creating innovative products, services or partner programs that have helped channel partners transform into true solution providers, ultimately helping customers take advantage of the ease of use, flexibility, scalability and savings that cloud computing offers. OrionVM’s Wholesale Cloud Platform is recognized for its ground-breaking cloud architecture that has opened up an entirely new wholesale business model for the channel, one that not only performs better for their customers - it also offers unbeatable margins for partners. OrionVM’s breakthrough approach to engineering cloud architecture dramatically reduces, by 50 percent or more, the overall COGS and datacenter footprint (power/hardware) needed to deploy premium cloud IT. The OrionVM Wholesale Cloud Platform enables service providers to brand and deploy their own enterprise-grade cloud in minutes, with no Capex, and at market-leading price to performance ratios with high margins for channel partners. Coverage of the100 Coolest Cloud Computing Vendors will be featured in the February 2015 issue of CRN and online at http://www.CRN.com. Please visit http://www.orionvm.com for more information on OrionVM or follow OrionVM on Twitter (@orionvm) and Facebook (https://facebook.com/orionvm). OrionVM is a wholesale Infrastructure-as-a-Service (IaaS) provider. The company's revolutionary technology suite (virtual storage, compute, orchestration and virtual networking) enables the delivery of high-performing, highly reliable cloud solutions at market-leading price/performance ratios. 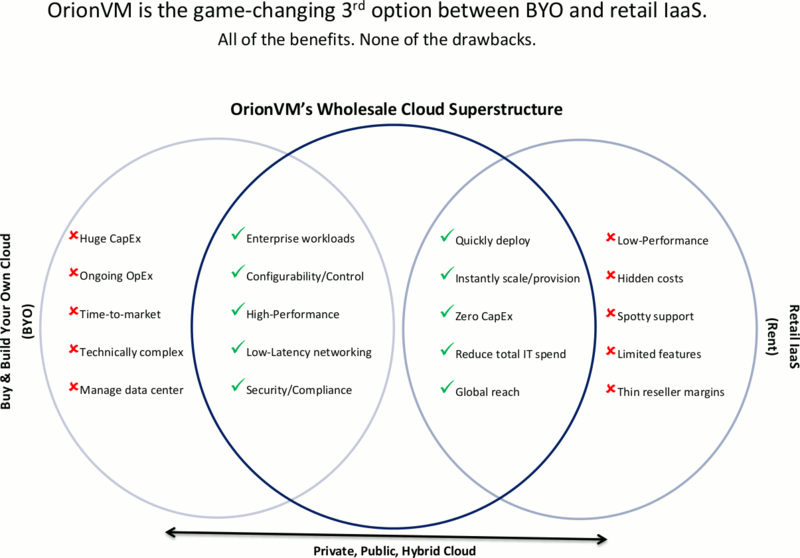 The OrionVM Wholesale Cloud Platform supports private, public, and hybrid cloud deployments and is built either for internal consumption or resale. Efficient and distributed enterprise-grade architecture allows clients to provide their own cloud offerings at margins of up to 80% off Amazon. Partners have full control – from a complete white-label rebranding to billing integration and flexible account management. OrionVM's technical vision represents a fundamental advancement for Cloud 2.0 infrastructure, which inspired tech luminary, Gordon Bell, to become a company angel investor. Global customers include publicly listed telcos, IT service providers, and leading enterprise SaaS companies. OrionVM was recently named New Product or Service of the Year for Software - Cloud Infrastructure in The 2014 American Business Awards. OrionVM company headquarters are in Sydney Australia and in the San Francisco Bay Area. For more information, please visit http://www.orionvm.com or follow the conversation on Twitter @orionvm.